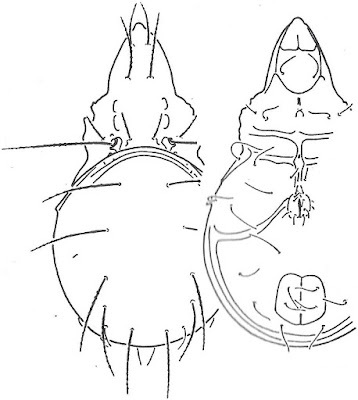 Dorsal (left) and ventral views of Lasiobelba minor, from Balogh & Balogh (1992 vol. 2). 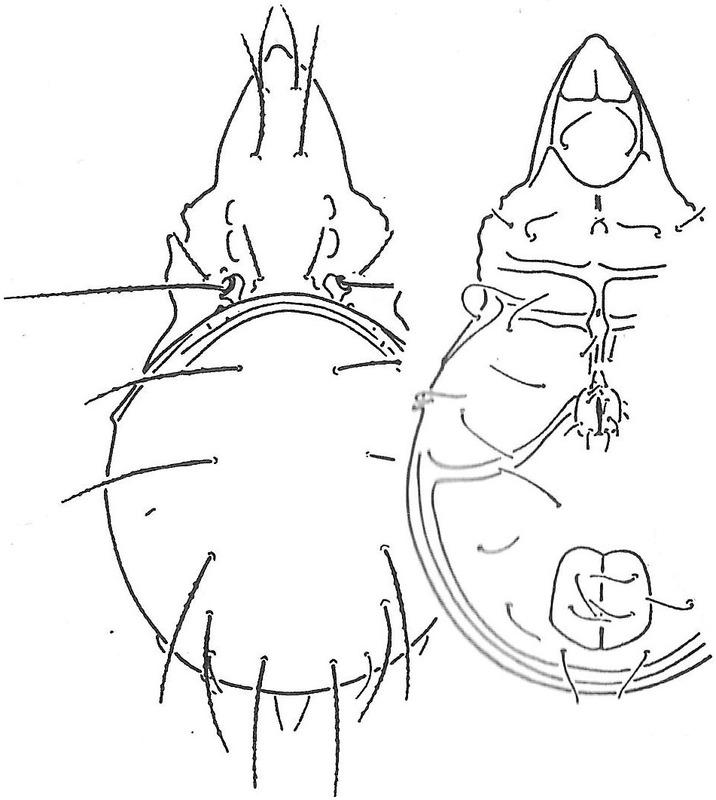 Lasiobelba is a pantropical genus of oppiid oribatid mites exhibiting notogastral heterotrichy (i.e. the presence of setae of noticeably different lengths on the notogaster). Characters (from Balogh & Balogh 1992): Prodorsum with costulae, lamellar and translamellar lines absent; interlamellar setae present; sensillus setiform or setiform and lanceolate. Notogastral heterotrichy present, with five or six pairs of long notogastral setae; crista absent. Genital plates with five pairs of setae. Balogh, J., & P. Balogh. 1992. The Oribatid Mites Genera of the World vol. 1. Hungarian Natural History Museum: Budapest. [S59] Sellnick, M. 1959. Acarina from southeastern Polynesia—II (Oribatidae). Occasional Papers of the Bernice P. Bishop Museum 22 (9): 109–152.